Next, I want to take a closer look at differences between styles of play. Below I have plotted a graph of each team’s successful defensive actions (the sum of tackles and interceptions per game) against their average possession. It is an interesting point to note that there is no real correlation between the two. This makes some sense. On the one hand, teams with more possession have less opportunity to make tackles or interceptions but on the other hand, teams that win the ball back more often end up with more possession. I have split the graph into four areas using the means for these statistics. I realise this isn’t the most sophisticated categorisation of team tactics but it does throw up some interesting results. 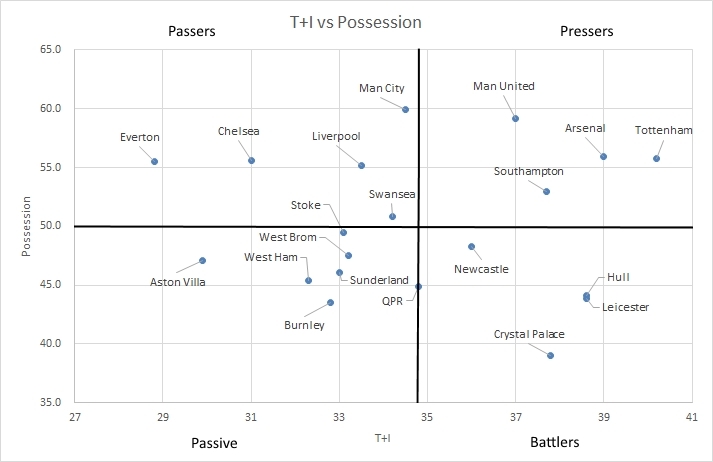 Teams in the top right quadrant have a lot of possession and make a lot of tackles and interceptions, implying they are aggressive at winning the ball back. I’ve called these pressers. The four teams in this section are some of the names you might expect. All have “cerebral” foreign managers – the hipsters choice – Wenger, van Gaal, Koeman and Pochettino. Tottenham Manager and Bielsa disciple, Mauricio Pochettino, is famous for his insistence on pressurising opponents and Spurs top the table for defensive actions. Teams in the top left have a lot of possession but don’t make that many defensive actions. They keep the ball well rather than winning it back aggressively. I’ve called these passers. Everton are unsurprisingly the most extreme example. Maybe this lack of aggression is why Roberto Martinez is experiencing that difficult second season. Chelsea pop up here, which may raise a few eyebrows. Perhaps their dominance of games has meant that they don’t need to put much effort into retrieving the ball. Mourinho’s teams do have a tendency to defend more deeply than some of their top of the table rivals. I’ve called the teams in the bottom right battlers. They don’t keep the ball very well but manage to make a lot of tackles and interceptions. This is the traditional English football stereotype and all four teams in this group boast traditional English bosses – “good football people”. In terms of these criteria, Hull and Leicester, managed by Steve Bruce and Nigel Pearson, are almost indistinguishable from each other. The last group of teams don’t have much of the ball and don’t seem to mind, I’ve labelled them passive – they do so little they don’t even get an agent noun. Predictably, the woeful Aston Villa are the most extreme example. Tim Sherwood has a lot of work to do. I’m not a big Sherwood fan but Villa can’t do much worse at the moment. Will be interesting to watch.